I've never really been much of a fan of whiskey liqueurs. I figure, if you're going to drink whiskey, drink whiskey. Or at least mix it with something yourself. Maybe I'm just old-school. 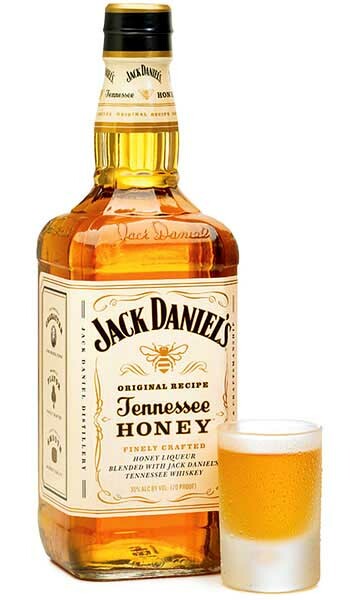 So when I heard about the new Jack Daniel's Tennessee Honey, I thought, "Um, no." But, fortunately it is better than I was expecting. This is reportedly a blend of Jack Daniel's Old Number 7 whiskey and honey liqueur. Fortunately, it still maintains a decent amount of whiskey-flavor. It pours a oddly light yellow color, lighter than the picture would have you believe, which looks (intentionally, I'm sure) like honey. It smells like sweet honey and vanilla, with a bit of the whiskey oakiness. You take a sip and get a mouthfull of honey, some sugary vanilla, and a kind of weirdly subdued stereotypical Jack Daniel's charred, sour mash whiskey flavor. It ends a little harsh, but not bad all things considered. Well, it is only 70 proof, too. Most surprisingly to me is how the honey flavor does not taste artificial. Plus, it's not nearly as sweet as I assumed. This was actually better than I was expecting. It still isn't something I would likely buy very often, but I wouldn't pass it up if someone offered it to me. It works decently on the rocks if you're in the mood, but is probably more intended to be chilled and taken as shots (the promo picture of the shot glass next to the bottle proves it). Drink This: if you want some whiskey, but like it a bit sweeter. It works on the rocks, but likely better as cold shots. Like I said, it was actually better than I thought it was going to be. Don't Drink This: if you want to drink whiskey neat. I tried it neat at room temperature and it was a bit overkill with the sweetness. Ice helps tame it quite a bit. I'm trying to think what kinds of mixed drinks this would be good in. Hot Toddy, perhaps? Honey Butter? Honey Bear? Honey Bunny? Honey Bombs? Okay, those are all just made up except the first one, obviously. Just wait, now you're going to see bars advertising Honey Bombs (Jack Daniels Honey + Red Bull). It's probably gross, though. But hey, I just invented it. History in the making right here, people. honey bombs are pretty tasty!!!! !